Inspired by our Japanese sushi making fun last weekend, we decided to have a fun foodie weekend every week, based on a different cuisine of the world. But something we could all make together, as a family. This weekend, we decided to go for Italian. I'm not a big fan of pizza myself, but Paul and David love pizza, so we decided to go for that. We cheated a little bit and bought ready made Napolina mini pizza bases, but we decided we might try again in the future from fresh dough. 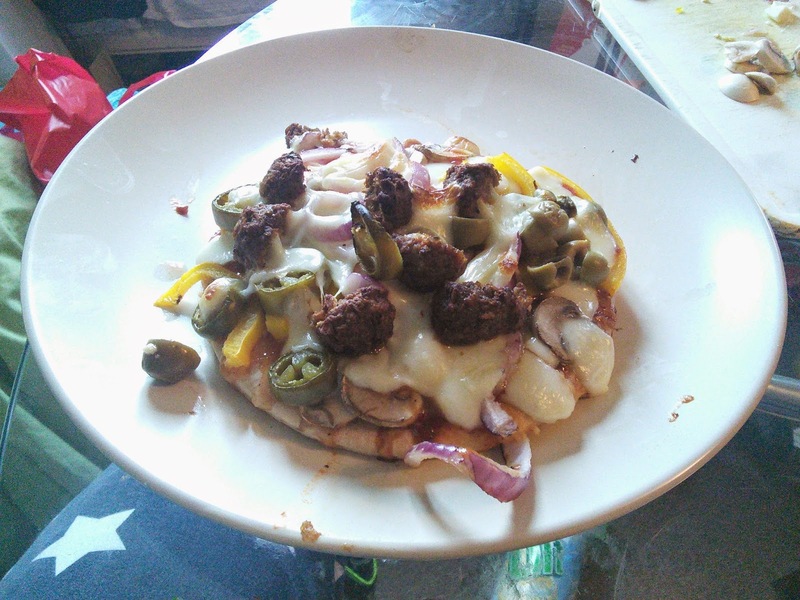 For our Saturday dinner and Sunday dinner, we had pizza both times, this is what we made and what it looked like. Well, yesterday (Saturday), I had tomato & basil sauce base, topped with sliced mozzarella. 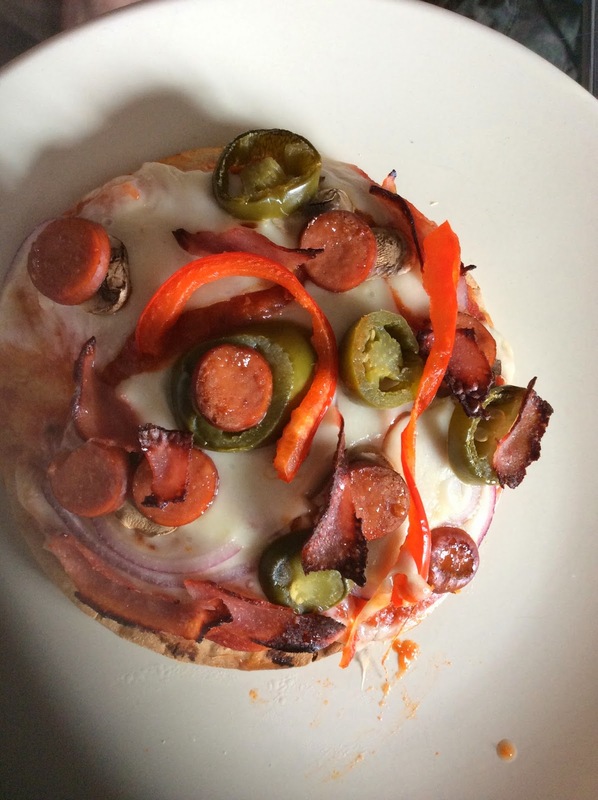 For my toppings, I chose smoked sausage, turkey ham, mushrooms, red peppers, jalapenos and red onion. David also had tomato & basil sauce base, topped with mozzarella. 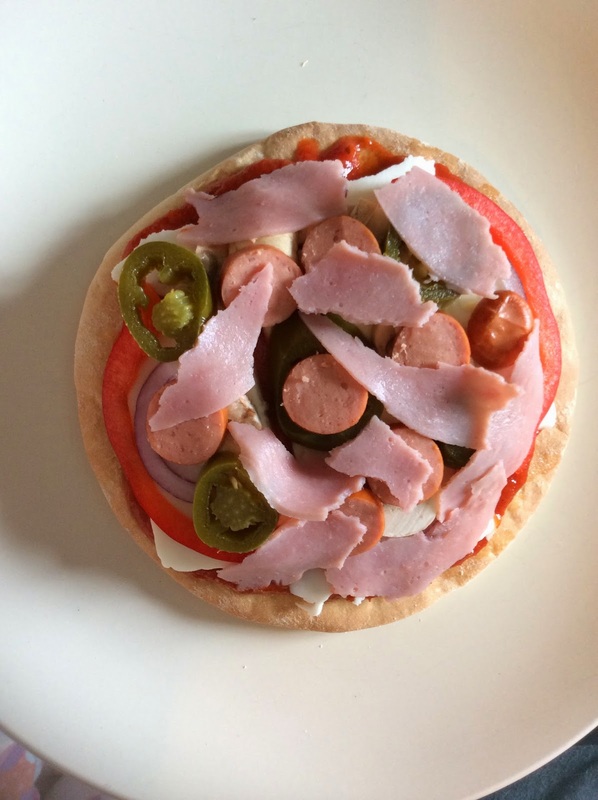 For his toppings, he chose red onion, turkey ham, pepperami, red pepper, jalapeno and olives. Fresh from the oven and ready to eat! Paul also had tomato & basil sauce base, topped with mozzarella. 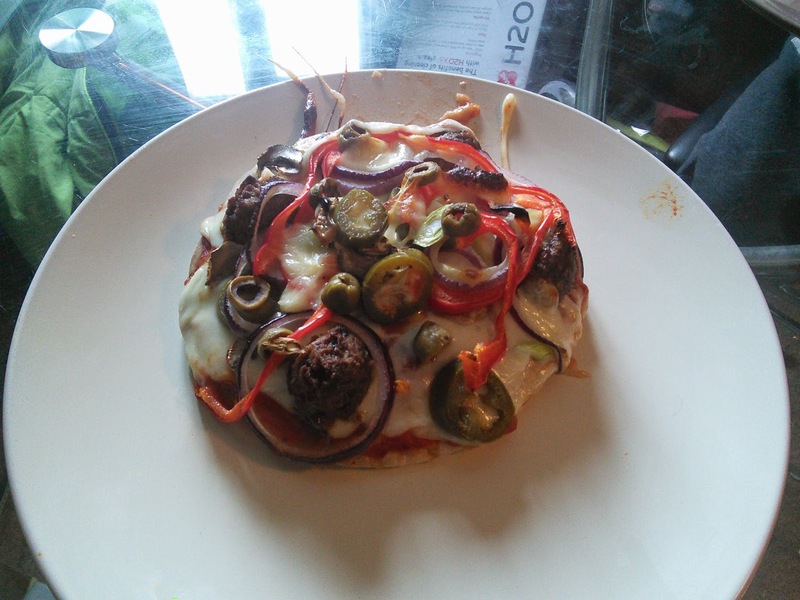 For his toppings, he chose meat free balls, red onion, jalapenos, mushrooms, red onions, olives, red pepper and extra mozzarella. As you can see, he really overdid it with the toppings (oink!) 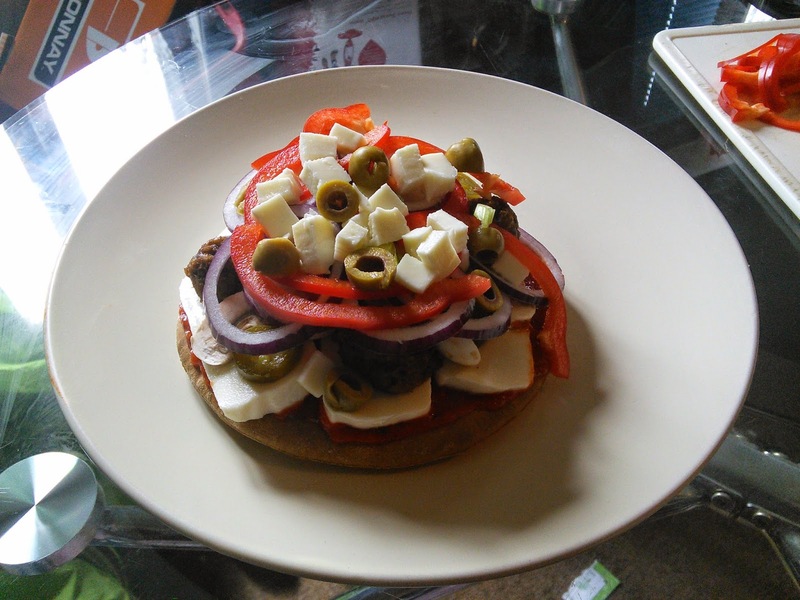 and it ended up looking more like a triple burger than a pizza! Paul's pizza is vegetarian as he is a vegetarian. David also had reggae reggae jerk sauce base, topped with sliced mozzarella. 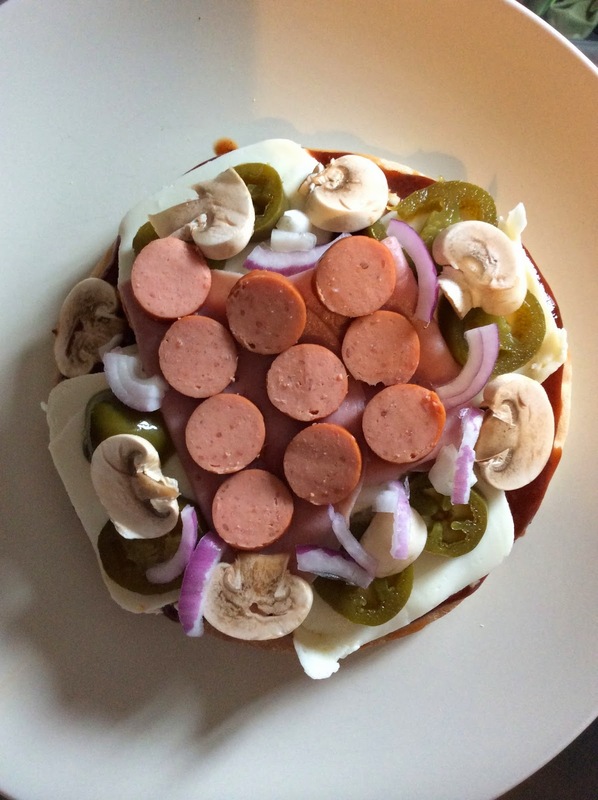 For his toppings, he chose yellow pepper, smoked sausage, pepperami, turkey hame, olives and jalapeno. Paul also had a half reggae reggae jerk sauce base and a half tomato & basil sauce base, topped with sliced mozzarella. 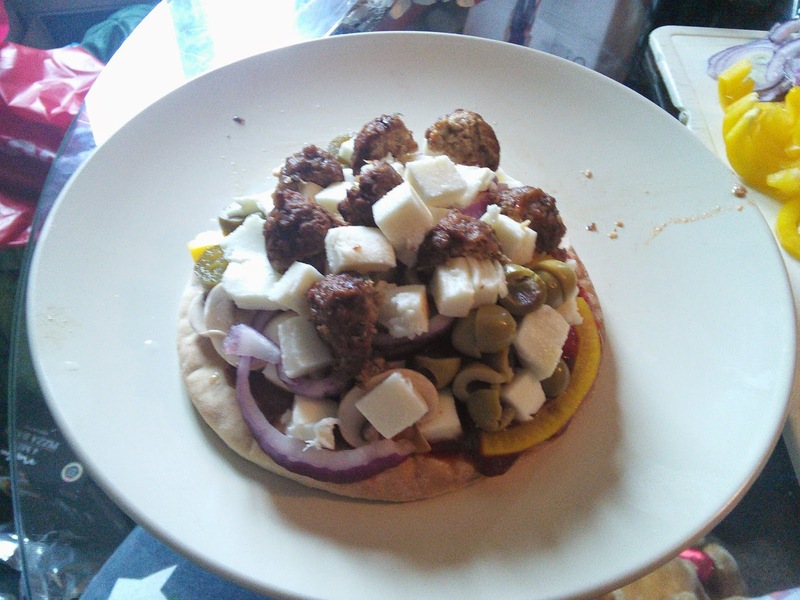 For his toppings, he chose meat free balls, red onions, jalapenos, yellow peppers, olives, mushrooms and extra mozzarella. 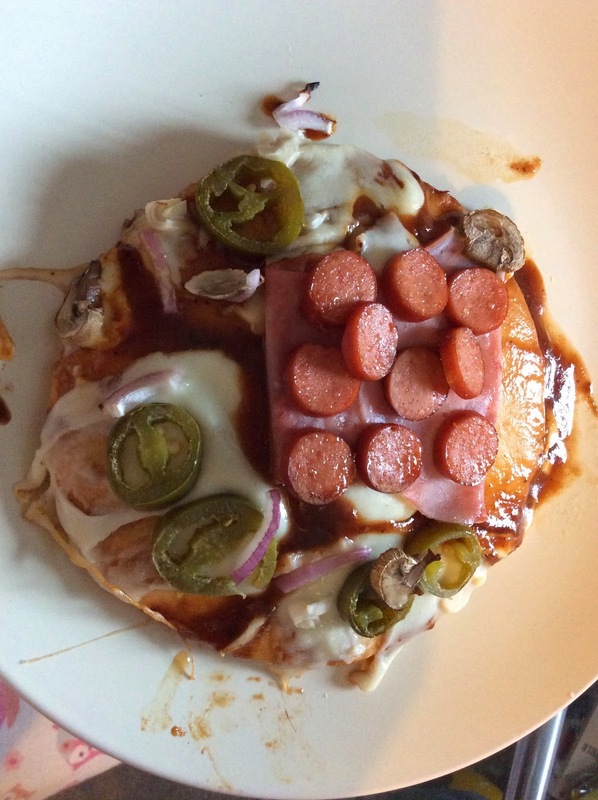 Again, he went crazy with the toppings (oink! oink!) and it ended up looking like a giant burger! We had fun making our pizzas. And there's no better way of making sure you get the toppings you like best in the right amounts!